Definition: Graves’ disease has also been called exophthalmic goiter, is an immune system disorder that results in the overproduction of thyroid hormones (hyperthyroidism). Although a number of disorders may result in hyperthyroidism, Graves’ disease is a common cause. Common symptoms of Graves’ disease include weight loss, prominent eyes, and puffy eyelids, racing or pounding heart, swollen thyroid gland, heat intolerance, nervousness, and insomnia. The exact cause is unclear; however, it is believed to involve a combination of genetic and environmental factors. A person is more likely to be affected if they have a family member with the disease. The diagnosis may be suspected based on symptoms and confirmed with blood tests and radioiodine uptake. Typically, blood tests show a raised T3 and T4, low TSH, increased radioiodine uptake in all areas of the thyroid, and TSI antibodies. Treatment of Graves’ disease is aimed at decreasing the number of thyroid hormones being produced by the thyroid gland, which relieves symptoms of the disease. Depending on the choice of treatment, individuals who are treated for Graves’ disease may have a temporary or permanent remission from Graves’ symptoms. Surgery to remove the thyroid is another option. Eye problems may require additional treatments. Graves’ disease will develop in about 0.5% of males and 3% of females. It occurs about 7.5 times more often in women than in men. Often, it starts between the ages of 40 and 60 but can begin at any age. 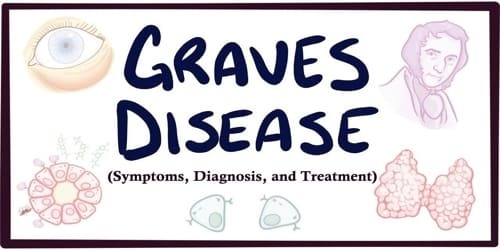 Graves’ disease is named after Robert J. Graves, an Irish doctor who described the condition in several of his patients in the 1830s. In Europe, the disease is often referred to as Basedow’s disease, named after a German physician, Carl A. von Basedow, who was also one of the first people to describe the illness. 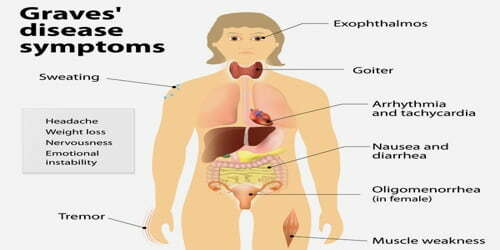 Signs and Symptoms of Graves’ disease: The signs and symptoms of Graves’ disease virtually all result from the direct and indirect effects of hyperthyroidism, with main exceptions being Graves’ ophthalmopathy, goiter, and pretibial myxedema (which are caused by the autoimmune processes of the disease). If people are experiencing any severe symptoms such as irregular heartbeat or difficulty breathing, it’s important to seek emergency care immediately. About 30 percent of people with Graves’ disease show some signs and symptoms of a condition known as Graves’ ophthalmopathy. If Graves’ ophthalmopathy is not treated, it can lead to nerve damage and even blindness. An uncommon manifestation of Graves’ disease, called Graves’ dermopathy, is the reddening and thickening of the skin, most often on our shins or the tops of our feet. Diagnosis and Treatment of Graves’ disease: Graves’ disease can be difficult to diagnosis at first. Aside from ophthalmopathy, most of the symptoms of Graves’ disease are shared with other conditions. A diagnosis of Graves’ disease is generally made on the basis of symptoms and confirmed with laboratory tests. During the physical exam, in addition to asking people about their symptoms, the doctor will likely measure their pulse and blood pressure, examine their eyes and thyroid gland, check their reflexes, and test them for a tremor. In addition, blood tests to find out people’s hormone levels may be performed. Based on their symptoms, other tests may be done. These could include an MRI, CT scan, or ultrasound of the eyes and eye sockets. 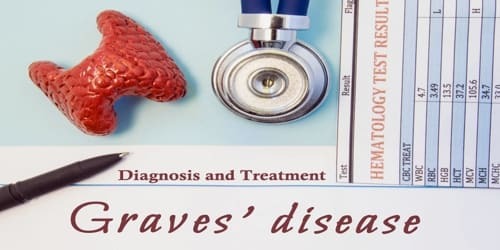 While all treatments for Graves’ disease come with potential side effects, it’s important to remember that delaying treatment for Graves’ disease can lead to serious health problems, such as a thyroid storm and heart failure.